North Milk River meanders through Sandstone Ranch at dusk, near Del Bonita, Alberta. 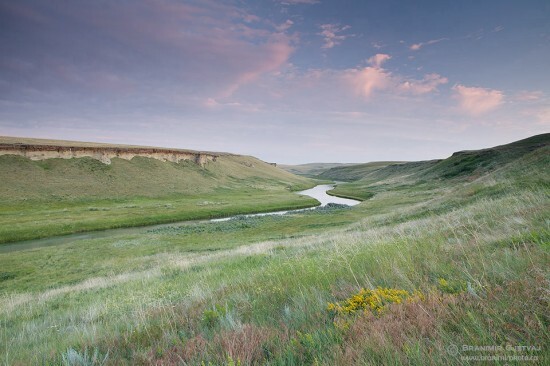 Sandstone Ranch is jointly managed by the Nature Conservancy of Canada, Alberta Conservation Organization, and the Sandstone Ranch Grazing Co-operative. 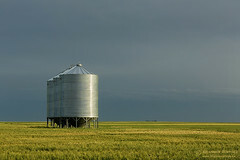 The 4,100 acre conservation property is located 75 km south of Lethbridge, just north of the Montana border. 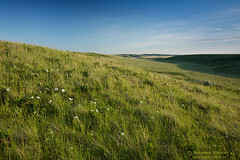 It protects a unique combination of fescue prairie and a diverse riparian habitat. 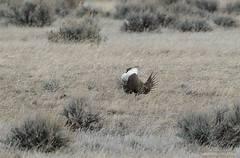 Sandstone cliffs and hoodoo rock formations along the river edge provide important nesting habitat for prairie raptors. I had an opportunity to spend two days photographing at the property, and was completely blown away by the beauty of the land and richness of it’s wildlife. This image was used by the Wilderness Committee (formerly the Western Canada Wilderness Committee) in their 2012 Canada’s Endangered Wilderness calendar. Your purchase of the calendar (or any other goodies) will support a worthy conservation work.